In a few short days, my time at the Tumbler Ridge Public Library will come to an end. Four years ago I walked in here as a newly-minted library technician. On July 12th, I'll be walking out as a library technician who has done it all. In the past four years, I've hired and trained pages and clerks, run children's programs, managed interlibrary loan services, and even served as Head Librarian for eight months. I've shelved, shelfread, and shifted. I've moved books, tables, and chairs. I've attended, helped coordinate, and even presented at Itchy Feet. I've written blog posts, drawn on the whiteboard, tried to make a Wikipedia entry for the library, revamped our job descriptions, timesheets, staff schedule and daily stat sheets, and helped design the library's current layout -- the biggest change this library has ever seen. For all that time except for my tenure as Interim Head Librarian, I've been at the same desk -- tucked away next to one of the library's light poles, with my back to the fire extinguisher. I remember when I first started, Sharon was around the corner from me. Her desk was still located inside the "Reference U" formed by the shelves that held the reference books on the inside and the adult non-fiction on the outside. I couldn't see her, but when I needed help, she was within ready voice range. When I started in 2008, we had well over 1100 VHS tapes, fewer than 200 DVDs, and not even enough graphic novels to fill a single shelf. At that time, I'd never heard of Paula Coutts, Entertaining Non-Fiction, or Evergreen. The iPhone 3G and the App Store were brand new, and I didn't want to be anywhere but in Tumbler Ridge, working at this library. For the past year, I've had a girlfriend and a life waiting for me outside of Tumbler Ridge, and I've finally decided to take the leap. Michele, for giving a brand new library technician a chance to return home. Brian, Richard, Yaeko, Jenn, Brenda, Hank, Jan, Bob, the Rec Centre staff, the folks at TRCCS, and supportive members of the library board and town council. Thanks Amanda, for keeping me grounded this year. It's that time of the year again! The countdown to Summer Reading Club is at less than a month. Join us for registration, banner signing, face painting, and lots of fun! It's time to pick up your reading record to keep track of the books you read this summer. The Summer Reading Club is the *best* way to keep kids busy and their minds active in Tumbler Ridge during the summer. The program is free, and funded by our generous sponsors. We're still looking for Summer Students to help run the Summer Reading Club. If you're interested, please take a look at the job posting page on the Library's website. Our Summer Students will be planning and leading story, craft, and activity sessions and performing other general work around the Library. On June 19th at 7pm, the Tumbler Ridge Public Library will be having a special meeting. The meeting will be to determine whether the library will transition from a library association to a municipal board run library. Voting at the meeting is open to all library association members (anyone with a library card/account) who are in good standing as of June 12th. You are *not* a member currently in good standing if any of the following apply. We encourage anyone who'd like to vote at the meeting to stop by the library before June 12th to ensure everything is in order with their account. Today was quite a day for the Summer Reading Club. The Library received *four* cheques in the mail that were donations for the Summer Reading Club. When I finished opening the mail, I walked over to Sharon with the sheaf of cheques in my hand and said "I have good news!" She was thrilled. Then the day got better. Glenn Auger from Spectra Energy stopped by the Library to deliver a large donation in person. It's because of fine folks like these that the Summer Reading Club is possible. Their support helps us to hire summer students to coordinate the program, purchase craft supplies, and buy prizes for the end of the summer. In short, we couldn't do it without them. Thank you! We're incredibly grateful! It's incredibly hard to believe, but we're less than a month away from the opening ceremonies for the Summer Reading Club. As a result, we've got a date for you to mark on the calendar: June 20th. Join us at the Tumbler Ridge Public Library on June 20th at 3pm to sign up for the Summer Reading Club. We'll be registering kids for the program, having everyone sign our SRC 2012 banner, and having many other fun activities packed into the afternoon. Without the support of sponsors like them, the Summer Reading Club would not be possible. Thanks to them for donating, thanks to you for reading, and we'll see you on June 20th! 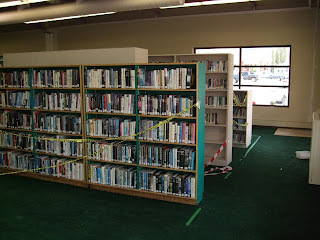 We're continuing to work on the library's entertaining non-fiction section. The work is happening in irregular spurts, however. We seem to alternate between a few days in a row where nothing is done because the library's senior staff members are really busy and a day of steady activity and progress. As it stands right now, we've pulled entertaining non-fiction from roughly three quarters of the library's non-fiction collection and as I've said. What's next? Paula, Sharon and I are working on it as time permits, and are mostly pulling things to be considered as entertaining non-fiction. Part of the idea behind an entertaining non-fiction section is that *any* book pulled from the shelves should be entertaining and hard to put down. In an ideal world, we'd set the bar high enough that if a patron borrows an entertaining non-fiction book on a subject he/she has even a minor interest in, the book won't be returned until that patron has read it cover to cover. At present, all the entertaining non-fiction books are still listed as general non-fiction in Evergreen and in our online catalogue. Once we've finished selecting the books that will become our entertaining non-fiction collection, we'll be creating a new category for them in Evergreen, and switch the books over to it. So when you search for entertaining non-fiction items in the catalogue, the search results will point you in the right direction. As I've posted about previously, I created a label we'll be using on the spine of all entertaining non-fiction books. It's distinct and very identifiable even at a distance, and will help the library staff to keep the entertaining non-fiction on its own shelves. Like with the library's other collections, we'll actively work on developing the entertaining non-fiction collection over time by buying new items and weeding old and unused ones. I know I'm heavily biased folks, but I'm excited about establishing this collection. I've worked here for nearly four years and have seen many of these books arrive at the library, but I still find myself wandering by the entertaining non-fiction shelves thinking "I'd like to read that book," "This book sounds interesting," or "I need to remember to borrow this book!" What's more, I think you'll do the same. It's been a while, but here I am again to tell you about something exciting happening at the library. 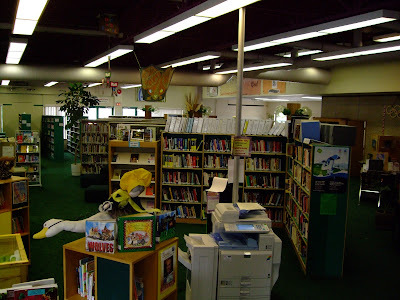 When Paula Coutts joined the library in late 2010, she told Sharon and me about a section in a library she'd used to work at: ENF - Entertaining Non-Fiction. We'd never heard of it, and Paula started to explain. Non-fiction falls into two broad categories: informative, and entertaining. A book that contains recipes, instructions on tying your shoes, or general facts falls into the former. The book may be interesting, and probably does contain valuable information, but is generally read for the purpose of learning rather than for enjoyment. The story of an African boy who built his own working electricity generating windmill from spare parts he scrounged. Describes the planes and pilots that fly for Buffalo Airways, an arctic airline, and the challenges they face in the frosty skies. Explores the stories of the legendary Sasquatch and the people who've searched for it for years. Still wondering what shaped a man like Bin Laden? Wonder no longer! This book talks at length about his family and its origins. The author was revealed to have exaggerated/falsified his stories and was ordered to repay money to his charity, but the stories about establishing schools in Afghanistan still resonate strongly. The legendary Canadian author describes the settling of Canada's west with a series of stories about Canadians of all walks of life. When the stresses on the Earth are all released at once, what will happen? According to this book, a storm of epic proportions! 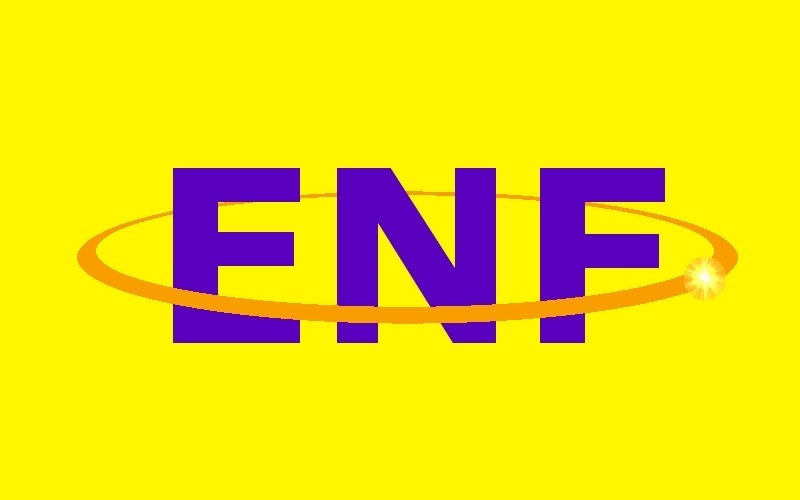 Anyway, the ENF collection should be interesting, so please keep an eye out for it! Hi everyone! We're on the cusp of Spring Break again, and we've got two great children's programs at the Library while the kids are off from school! Sharon Bray will be leading children in a week-long paper mache project. The kids will start with the basics -- a shape, newspaper, and Sharon's patented mix of flour, water, and glue. By the end of the week, they'll have completed an artistic paper mache object! Jacob Fehr will be showing children how to turn common squares of paper into fun animals and other objects all week. The kids will start with the basics -- squares, dogs, and penguins, and by the end of the week will be folding raptors and cranes! I said it above in the workshop descriptions, but I'll reiterate it here: pre-registration is required. We've only got a limited amount of space available, so sign up now! In March of this year, one public library existed in Tumbler Ridge. It had a purple ceiling, very old green carpet, and a layout that made the library appear much smaller than it actually was. 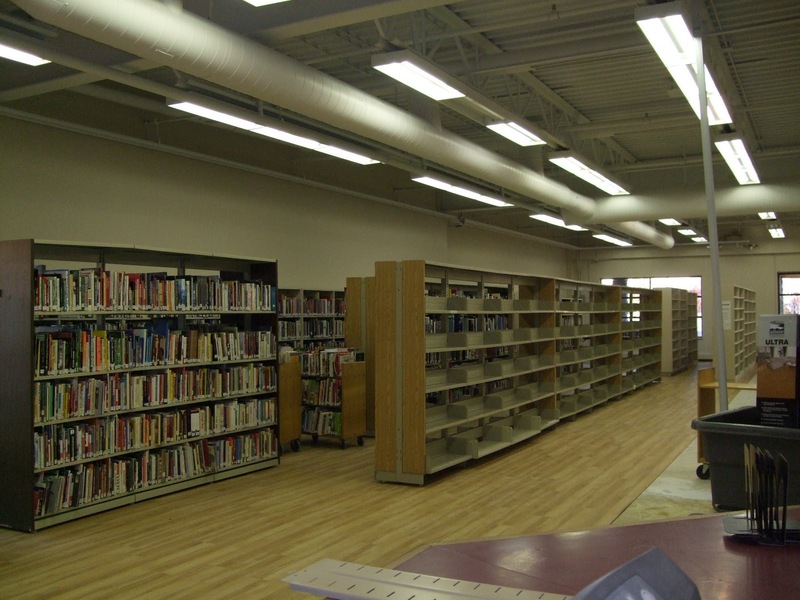 By the end of October, a different library existed in Tumbler Ridge. It had a bright ceiling, new flooring, and a much better layout. So who made the changes from the first library to the second? On her very first day of work with us last November, Paula told Sharon and me that the Library felt a little cramped and dark, and that three things needed to be changed: the ceiling colour, the flooring (for safety reasons as well as to lighten the library), and the shelf layout. I can't speak for Sharon, but I took a bit of offense to her comments, as I had rearranged a few things earlier in the year that opened up the library layout somewhat. In any case, I was impressed by the scope of her thoughts about the library, but I wasn't sure if we'd even get that much done over the next two or three years. ...It took less than a year. 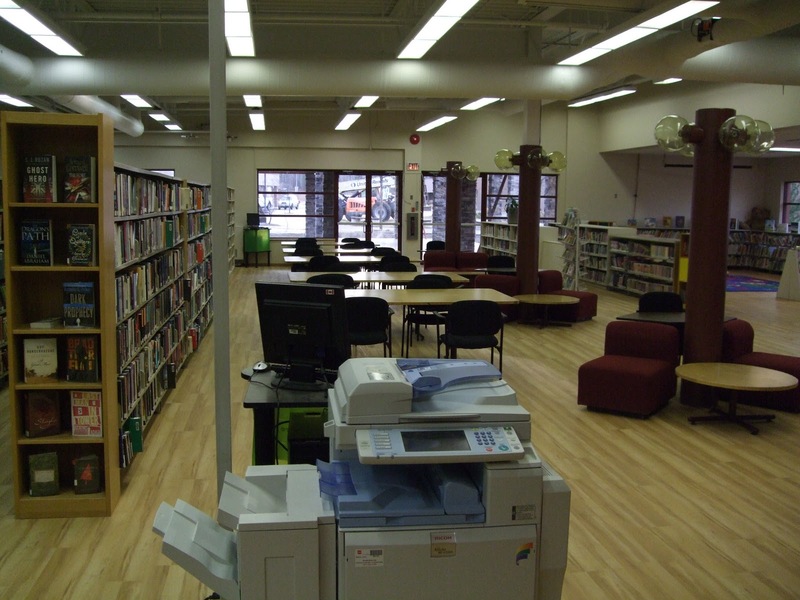 During our grant-in-aid application last year, Paula requested funds to replace the library's flooring. The District of Tumbler Ridge granted us those funds, and they were held by the Community Centre until needed. 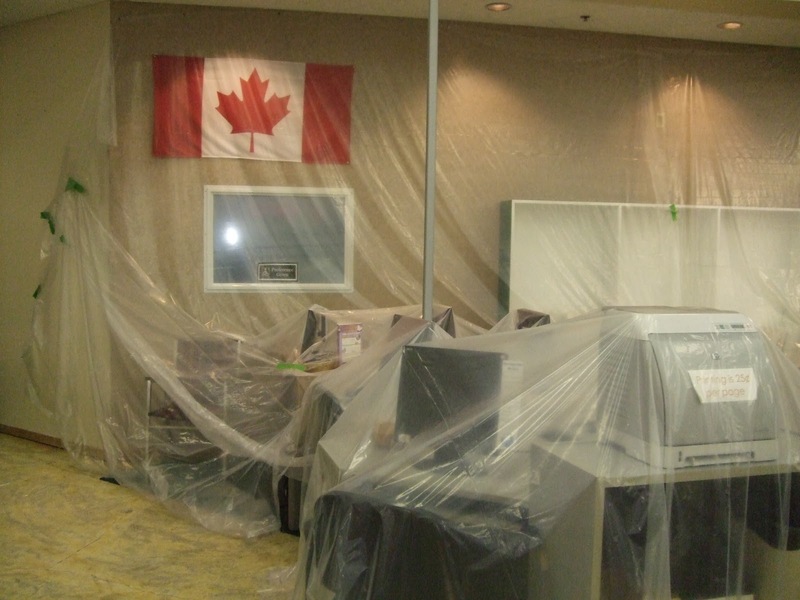 In April, construction resumed on the exterior of the Community Centre, and the library was asked to move everything at least five feet away from the exterior walls. With some help from Community Centre staff, we moved shelves, placed a great deal of furniture in storage, and prepared ourselves for cramped conditions for a few months. Paula, Sharon, and I continued working away at the details of our flooring and rearranging project during this time. The Library staff decided on a type of flooring and a colour for the walls, and I spent a few days making a detailed map of the library and its furniture to design a new layout with. 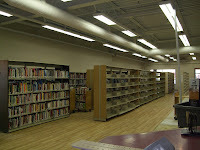 After a comment by Sharon, Paula asked the Community Centre maintenance staff to look into how easy it would be to remove the walls enclosing the reference room. When we came in to open the library the next day, half of the walls enclosing the reference room had already been removed. The remaining walls were removed over the next day. In early September, Paula hired a contractor to paint the library's ceiling. The library staff (and Sharon's husband, who helped out) spent a day tarping everything in the library, and we were forced to close for two days while the painting was in progress. Once we reopened, we prepared for the real work on the library. Paula had hired a contractor to paint the walls and install the flooring, and he began work in early October. 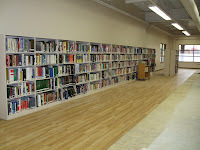 In a few short days, he had the library painted, and began installing the flooring. 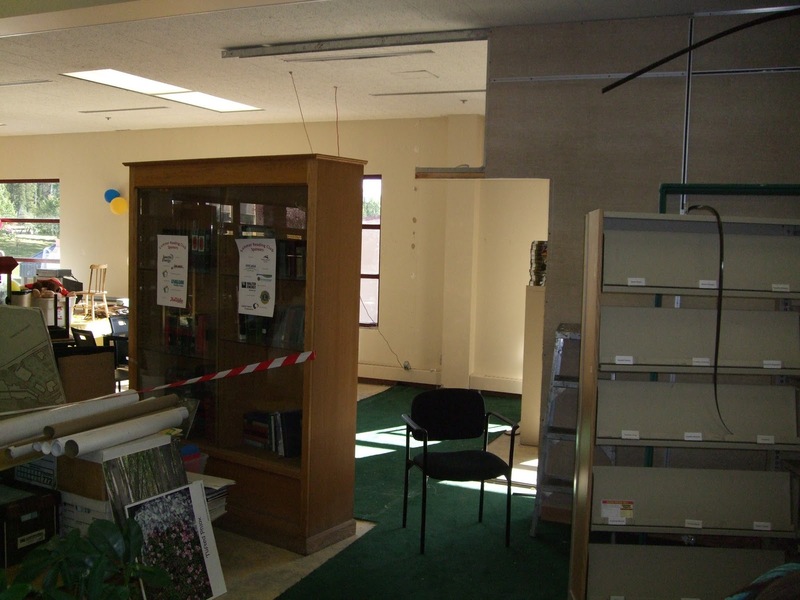 Library staff members worked frantically to stay ahead of him by moving books and shelves away from where flooring still had to be laid, while putting as many shelves in their final locations as soon as possible. By October 19th, we were finished. So what's great about the new layout? So that's it folks. A tale of two libraries. On behalf of the library staff, I'd like to thank all our library clients who have complimented us on the work we've done. It wasn't always fun, but I think the end result was certainly worth all the effort. Effective September 1, 2011, the library's overdue system will be changing. Patrons will now be billed and suspended once any of their borrowed items becomes six weeks overdue. So what's the reason behind all of these changes? It's not that we hate our patrons. We like them a lot! Without patrons, we wouldn't get to work at the library! It's also not a way for us to bring a lot of money into the library. In the past year (July 2010 - June 2011) the library has collected around $100 per month on average from all overdue fees and replacement fees for lost books. This represents a very small portion of the library's budget, and if our patrons all return their borrowed items on time, we won't even be collecting that much in the future. So why are we increasing our overdue fees? The main reason for increasing our overdue fees is simply to have patrons return their borrowed items on time. The majority of the library's patrons always return things on time, and the changes to our overdue fees will not affect them at all. However, we do have a small number of perpetually overdue patrons. These patrons, while very nice in many other ways, seldom return their items on time, and perhaps increased overdue fees will provide some encouragement for them to do so. There are a few other reasons though. The library makes it reasonably easy for you not to have overdue items. If we have your current e-mail address in our system, you will automatically receive a courtesy e-mail three days before your items are due. We're centrally located, only a minute walk from the main parking lot in the shopping district. When you borrow items, you're given a date due slip. You may renew items in person, online, or by phone. Finally, the library hasn't increased its overdue fees in years. The cost of books and other library materials has been rising steadily for years, and our overdue fees do not reflect this. We're not naive, folks. We know some of our patrons will be unhappy with the changes to our overdue system. But if it encourages all of our patrons to keep track of their library items and return them on time, it'll make things better for all of us.